To Cite: Dalili Kajan Z, Khalighi Sigaroudi A, Khosravifard N, Farsam N. Comparison of the Mandibular Foramen Position Among Different Skeletal Classes Using Panoramic Radiographs, Iran J Ortho. 2019 ; 14(1):e65691. doi: 10.5812/ijo.65691. Background: The mandibular foramen has often been considered as the most reliable reference point for several anesthetic and surgical procedures in the maxillofacial region. This study evaluated the position of the mandibular foramen in different skeletal classes. Methods: A total of 90 panoramic and lateral cephalometric images belonging to class I (n = 30), class II (n = 30), and class III (n = 30) patients were used for this study. The position of the mandibular foramen in relation to the anterior and posterior borders of the mandibular ramus, inferior border of the mandible, sigmoid notch and occlusal plane was determined in each panoramic radiograph. Results: The position of the mandibular foramen relative to the occlusal plane and the sigmoid notch significantly differed among the three skeletal groups; however, no significant difference existed among the skeletal classes with regard to the position of the mandibular foramen in relation to the anterior and posterior borders of the ramus and the inferior border of the mandible. Conclusions: The position of the mandibular foramen tends to be lower in skeletal class II patients; therefore, it seems that lower injection heights in these patients could result in better outcomes. Copyright © 2019, Iranian Journal of Orthodontics. This is an open-access article distributed under the terms of the Creative Commons Attribution-NonCommercial 4.0 International License (http://creativecommons.org/licenses/by-nc/4.0/) which permits copy and redistribute the material just in noncommercial usages, provided the original work is properly cited. The inferior alveolar nerve is the largest branch of the mandibular nerve that enters the mandibular foramen together with the inferior alveolar artery. The nerve supplies the pulps of ipsilateral mandibular teeth, periodontal ligaments, lower lip, and the chin skin (1). The mandibular foramen is considered as the most reliable reference point for accessing the inferior alveolar nerve (2). Knowledge of the exact location of the mandibular foramen is crucial for successfully performing mandibular block anesthesia. Proper accomplishment of other procedures such as sagittal split ramus osteotomy, vertical ramus osteotomy, inverted L osteotomy, orthognathic surgery, mandibular trauma management, benign and malignant lesion removal, and preprosthetic surgery also depends on proper localization of the position and path of the mandibular foramen and canal (3, 4). Radiography is considered as the only non-invasive method of diagnosing and treatment planning for the surgical procedures of the mandible. Among the various imaging modalities, panoramic radiographs are routinely used for screening, diagnosing and selecting the most appropriate surgical approach. It has been postulated that the position of the mandibular foramen differs among various ethnic groups (1, 5-8); moreover, the mandibular foramen gradually changes its position corresponding to the growth of the mandibular ramus in children (4, 9). Considering the variations in mandibular morphology among different skeletal classes, the present study was aimed at evaluating the position of the mandibular foramen in class I, II and III skeletal groups using panoramic radiographs; thereby, reducing the risk of mislocalization of the foramen during surgical and anesthetic procedures. Panoramic radiographs of 90 patients aged between 18 - 35 years were used for the present study. The radiographs belonged to 30 skeletal class I, 30 skeletal class II and 30 skeletal class III patients. The patients’ skeletal classes were determined by two skilled orthodontists based on the criteria of Steiner’s cephalometric analysis using patients’ lateral cephalograms. As the radiographs had already been taken for other purposes, no additional radiographic exposure was imposed on the patients for the performance of this study. Radiographs of patients with systemic disorders, jaw asymmetry, prior orthognathic surgery and absence of mandibular molar teeth were not included in the investigation. Furthermore, radiographs that suffered from poor resolution, improper geometry, head rotation and motion artifacts were excluded from the study. In case the mandibular foramen could not be identified with certainty on the panoramic image, the radiograph was not included in the study sample. All panoramic and lateral cephalometric images had been prepared by Cranex D machine (Soredex, Helsinki, Finland). The radiographs were printed with 1:1 magnification factor by Dry Laser printer (Dry Pro 873-Konica Minolta, Tokyo, Japan). The ethical approval number of this research was IR.GUMS.RED.1394.647 (registered by Guilan University of Medical Sciences). In each panoramic image, the anterior and posterior borders of the mandibular ramus, inferior margin of the sigmoid notch and inferior border of the mandible were drawn bilaterally on a tracing paper by a senior dental student and confirmed by a qualified maxillofacial radiologist with 15 years of professional experience. The center of the mandibular foramen (point “O”) was identified by the radiologist on all panoramic images. A horizontal tangent line along the inferior margin of the sigmoid notch was drawn. 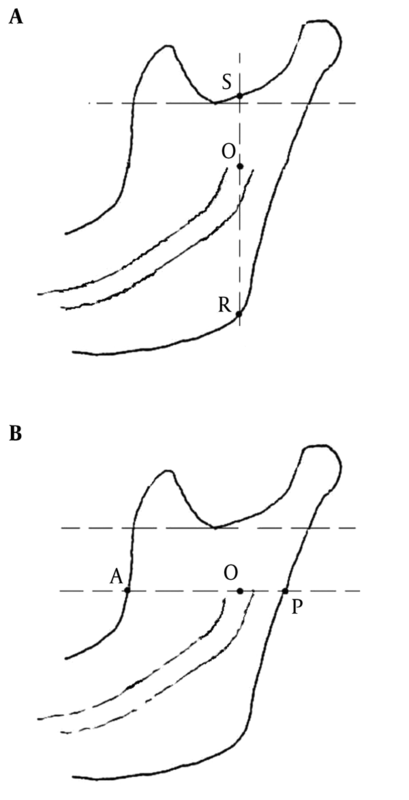 A vertical line that passed through the center of the mandibular foramen was drawn perpendicular to the tangent of the sigmoid notch until it cut the tangent superiorly (point “S”) and the inferior border of the mandible inferiorly (point “R”) (Figure 1A). 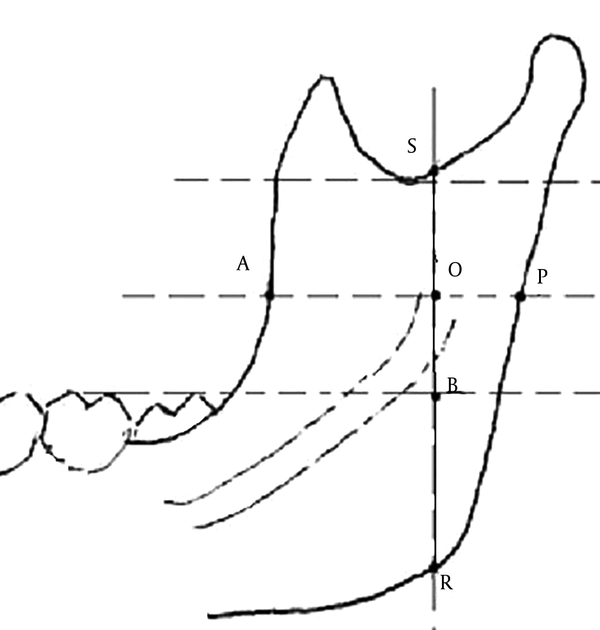 Another line passing horizontally through the center of the mandibular foramen was drawn parallel to the tangent of the sigmoid notch; the point at which this line met the anterior border of the ramus was named “A” and the point at which it reached the posterior border of the ramus was defined as “P” (Figure 1B). The occlusal plane was identified as a line passing through the distal cusp tip of the mandibular second molar tooth and parallel to the tangent to the sigmoid notch. The point at which the occlusal plane crossed the vertical line through the center of the mandibular foramen was named “B” (Figure 2). The mean values for H, V1, V2 and V3 ratios in different skeletal classes were analyzed by means of ANOVA test. P value < 0.05 was considered to be statistically significant. Of the 90 cases studied, 19 (21.1%) were males and 71 (78.9%) were females. Mean age of the patients was 23.91 ± 4.1with the minimum age being 18 and the maximum age being 35 years. The ANOVA test revealed no significant differences in OS (P = 0.41), OA (P = 0.21), OP (P = 0.33), SR (P = 0.35) and OR (P = 0.11) dimensions among the three skeletal classes; however, OB and SB dimensions showed significant differences among the skeletal groups (P = 0.001). Furthermore, only the V3 ratio differed significantly in class I, II and III skeletal groups (P = 0.001). Tables 1 and 2 represent the distances and ratios in different skeletal classes respectively. Comparison of the distances and ratios among the skeletal classes based on patients’ right and left sides showed similar results as the above mentioned summated ones. In this regard, the ANOVA test revealed that in either side of the patients’ mandibles, there were statistically significant differences in OB dimension, SB dimension and V3 ratio among the skeletal classes (P = 0.001). It is obviously clear that precise localization of the mandibular foramen and lingula is essential for proper performance of several surgical and anesthetic procedures (10). Moreover, position of the mandibular foramen is of utmost importance for neurolysis in neuralgia (11). Failure to properly identify the location of lingula and mandibular foramen could result in complications such as hemorrhage and nerve injury during surgical procedures (12, 13). As there are considerable variations in the position of mandibular structures among different skeletal classes, the present study was conducted to determine the position of mandibular foramen in class I, II and III patients using panoramic radiographs. In the study performed by Kaffe et al. (3), position of the mandibular foramen was evaluated on panoramic radiographs in comparison with the true position on dry skulls. In the mentioned study, panoramic radiographs were prepared by two different panoramic machines, namely Orthoralix SD and Panelipse. The mean distance from the mandibular foramen to the lowest point of the mandibular notch was calculated 21.89 mm on the dry skulls, 24.94 mm on the images taken with Orthoralix SD and 23.55 mm on the images taken with Panelipse. The aforementioned distance which was measured on panoramic images of Cranex D machine in our study was calculated 13.2 mm in class I, 13.69 mm in class II and 14.16 mm in class III patients. The dissimilarities in the obtained results could be explained by the differences in the panoramic devices used, the magnification value of the panoramic machines and perhaps most important, the ethnicity of the study patients. Prado et al. (14) reported vertical distances of the mandibular foramen from the sigmoid notch and inferior border of the mandible in dentate and edentulous Brazilian mandibles. The upper vertical distances were greater than reported “OS” distances and the lower vertical distances were smaller than reported “OR” distances in the present study. The linear horizontal measurements between the mandibular foramen and posterior border of the ramus were significantly greater than reported “OP” distances in the current study. Park and Lee (15) measured vertical distances of the mandibular foramen from the sigmoid notch on CBCT images of normal occlusion, skeletal class II and III malocclusion patients. Our results showed significantly lower values than their reports; 21.59 in normal occlusion, 20.49 in class II and 18.77 in class III malocclusion patients. They used reconstructed panoramic views for their measurements instead of three dimensional views. They also stated that the vertical length of the mandibular ramus in class III malocclusion patients was greater than the other two groups; this finding was in agreement with ours. Kim et al. (6) measured the distance from the mandibular lingula to the anterior border of the ramus on dry skulls using a caliper. They found the mentioned distance to be 17.5 mm in dentulous patients which was almost similar to that of our study in which the distance between the mandibular foramen and the anterior border of the ramus was 17.53 in class I, 16.58 in class II and 17.34 in class III patients. These distances were lower than those reported by Park and Lee in their study on CBCT images (15) and also Seo et al. (16) in their study on panoramic radiographs. In the study performed by Jansisyanont et al. (5) on the shape, height and position of the lingula in Thai dry skulls, the results were very close to our study; however, our study was performed on panoramic images of the patients rather than dry skulls. Keros et al. (17) evaluated the distance of the mandibular foramen to the sigmoid notch and anterior border of the ramus in two groups of patients with and without successful inferior alveolar nerve anesthesia. Their measurements were to some extent different from those of our study, most likely due to different panoramic devices used. In their text book of local anesthesia, Malamed (18) suggested that during inferior alveolar nerve block, the injection height should be 6 - 10 mm above the occlusal plane. In the current study, we came to the conclusion that the injection height ought to be 10.27 mm in class I, 8.18 in class II and 12.3 in class III patients. To our knowledge, until now only limited researches have been performed on the position of the lingula and mandibular foramen in different skeletal classes. Our study revealed that the distance between the mandibular foramen and the occlusal plane is least in skeletal class II patients; therefore, less injection height from the sigmoid notch should be chosen during inferior alveolar nerve block in these patients in comparison with class I and class III groups. However, no significant differences exist between class I and III patients regarding the injection height in achieving inferior alveolar nerve anesthesia. Considering the position of the mandibular foramen in the horizontal plane, there is no substantial variation among the different skeletal classes; hence the injection is performed in an analogous antero-posterior location. Finally, it is suggested that the position of the mandibular foramen and its surrounding structures be evaluated via CBCT examinations to take advantage of images with less distortion and magnification. In conclusion, it seems that the position of the mandibular foramen tends to be lower in skeletal class II patients; therefor, lower injection heights in these patients might increase the success rate of inferior alveolar nerve blocks. We wish to express our appreciation to Dr. N Kariminasab and Dr. J Khademi (Department of Orthodontics, Guilan University of Medical Sciences) for their help with the cephalometric analyses. Also, we would like to acknowledge Ms. Fatemeh Salamat (Department of Biostatistics, Guilan University of Medical Sciences) for her assistance in analyzing the statistical data. Conflict of Interest: We have confirmed that there is no known conflict of interests associated with this investigation. Ethical Considerations: The ethical approval number of this research was IR.GUMS.RED.1394.647 (registered by Guilan University of Medical Sciences). http://www.gums.ac.ir/research. Funding/Support: There has been no significant financial support for the work described herein that could have influenced its results. 1. Lopes PT, Pereira GA, Santos AM. Morphological analysis of the lingula in dry mandibles of individuals in Southern Brazil. J Morphol Sci. 2010;27(3-4):136-8. 2. Devi R, Arna N, Manjunath KY; Balasubramanyam. Incidence of morphological variants of mandibular lingula. Indian J Dent Res. 2003;14(4):210-3. [PubMed: 15328986]. 3. Kaffe I, Ardekian L, Gelerenter I, Taicher S. Location of the mandibular foramen in panoramic radiographs. Oral Surg Oral Med Oral Pathol. 1994;78(5):662-9. doi: 10.1016/0030-4220(94)90182-1. [PubMed: 7838477]. 4. Kanno CM, de Oliveira JA, Cannon M, Carvalho AA. The mandibular lingula's position in children as a reference to inferior alveolar nerve block. J Dent Child (Chic). 2005;72(2):56-60. [PubMed: 16294933]. 5. Jansisyanont P, Apinhasmit W, Chompoopong S. Shape, height, and location of the lingula for sagittal ramus osteotomy in Thais. Clin Anat. 2009;22(7):787-93. doi: 10.1002/ca.20849. [PubMed: 19644966]. 6. Kim HJ, Lee HY, Chung IH, Cha IH, Yi CK. Mandibular anatomy related to sagittal split ramus osteotomy in Koreans. Yonsei Med J. 1997;38(1):19-25. doi: 10.3349/ymj.1997.38.1.19. [PubMed: 9100479]. 7. Tuli A, Choudhry R, Choudhry S, Raheja S, Agarwal S. Variation in shape of the lingula in the adult human mandible. J Anat. 2000;197 ( Pt 2):313-7. doi: 10.1046/j.1469-7580.2000.19720313.x. [PubMed: 11005723]. [PubMed Central: PMC1468130]. 8. Fabian FM. Observation of the position of the lingula in relation to the mandibular foramen and the mylohyoid groove. Ital J Anat Embryol. 2006;111(3):151-8. [PubMed: 17312921]. 9. Ezoddini Ardakani F, Bahrololoumi Z, Zangouie Booshehri M, Navab Azam A, Ayatollahi F. The position of lingula as an index for inferior alveolar nerve block injection in 7-11-year-old children. J Dent Res Dent Clin Dent Prospects. 2010;4(2):47-51. doi: 10.5681/joddd.2010.013. [PubMed: 22991596]. [PubMed Central: PMC3429971]. 10. Sekerci AE, Cantekin K, Aydinbelge M. Cone beam computed tomographic analysis of the shape, height, and location of the mandibular lingula in a population of children. Biomed Res Int. 2013;2013:825453. doi: 10.1155/2013/825453. [PubMed: 24490173]. [PubMed Central: PMC3893742]. 11. Tsai HH. Panoramic radiographic findings of the mandibular foramen from deciduous to early permanent dentition. J Clin Pediatr Dent. 2004;28(3):215-9. doi: 10.17796/jcpd.28.3.gt48634942137234. [PubMed: 15163149]. 12. Monnazzi MS, Passeri LA, Gabrielli MF, Bolini PD, de Carvalho WR, da Costa Machado H. Anatomic study of the mandibular foramen, lingula and antilingula in dry mandibles, and its statistical relationship between the true lingula and the antilingula. Int J Oral Maxillofac Surg. 2012;41(1):74-8. doi: 10.1016/j.ijom.2011.08.009. [PubMed: 21955366]. 13. Aminabadi NA, Farahani RM, Oskouei SG. Site-specificity of pain sensitivity to intraoral anesthetic injections in children. J Oral Sci. 2009;51(2):239-43. doi: 10.2334/josnusd.51.239. [PubMed: 19550092]. 14. Prado FB, Groppo FC, Volpato MC, Caria PH. Morphological changes in the position of the mandibular foramen in dentate and edentate Brazilian subjects. Clin Anat. 2010;23(4):394-8. doi: 10.1002/ca.20973. [PubMed: 20235169]. 15. Park HS, Lee JH. A comparative study on the location of the mandibular foramen in CBCT of normal occlusion and skeletal class II and III malocclusion. Maxillofac Plast Reconstr Surg. 2015;37(1):25. doi: 10.1186/s40902-015-0024-2. [PubMed: 26301208]. [PubMed Central: PMC4539352]. 16. Seo BS, Lee JH, Kim KW. A comparative study on the location of the mandibular foramen in panoramic radiographs of normal occlusion and mandibular prognathism. J Korea Assoc Maxillofac Plast Reconstr Surg. 2002;24(3):244-51. 17. Keros J, Kobler P, Baucic I, Cabov T. Foramen mandibulae as an indicator of successful conduction anesthesia. Coll Antropol. 2001;25(1):327-31. [PubMed: 11787558]. 18. Malamed SF. Handbook of local anesthesia. 6th ed. St. Louis: Mosby Co; 2013. p. 210-5.